Alex, you’ve been a pretty stalwart Hughes & Kettner guy for a while now. Did you use them again for this album? Lifeson: No, I didn’t. I made a change this year. I used a Marshall Silver Jubilee 2553. It’s a 25-/50-watt amp from the ’80s. I also used one of the new Mesa/Boogie Mark Five heads—it’s got, like, nine amps in it. I loved the way that sounded for all the clean stuff. I also had a 50-watt Marshall, Marshall 2×12 combos that I got way back in the ’80s, a Bogner, and other stuff. I’ve used Hughes & Kettner gear for quite a few years, and I love their equipment. It’s excellent, and they’re great people to work with, but I felt that after so many years it was time for a change. I really wanted my guitar sound to be a little different this tour. So I started out with that setup—the Boogie and the Marshall, with a Hughes & Kettner Coreblade to augment some different effects. And then Skully found this company [Mojo Tone] that handwires amps in North Carolina, and they built me an amp called the Lerxst Omega—Lerxst is my nickname—and we based it on what I liked about that Marshall. It sounds fantastic. Really nice saturation, great warmth. I’m really, really happy with it. I think part of the reason I got tired of Hughes & Kettner is that we were running three channels in the one amp, and I was finding that when I was switching between the channels I was getting some noise—thumps—and after hearing the Marshall I thought the sound was a little bit thin, a little processed compared to a screaming, single-purpose amp. I understand that that’s a bit of a compromise, and it’s certainly no reflection on the Hughes & Kettner gear, but it was time for a change for me. Did you use the Lerxst Omega in the studio, or is it just for the tour? Lifeson: No, that didn’t come out until we were in our final stage of rehearsal. I used the Marshall for the primary rehearsals for six weeks, and then that arrived and, sadly, the Marshall now resides in a case somewhere [laughs]. 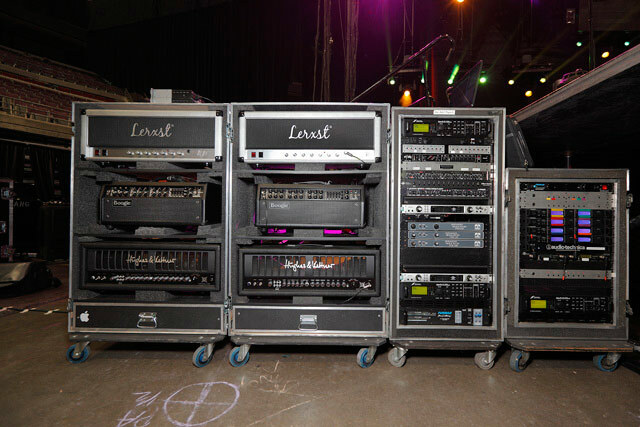 So which amps are you taking on the road? Lifeson: I’m taking the Lerxst and a backup, a Mesa/Boogie Mark Five and a backup, and a Coreblade with a backup. I’m also using [Apple] MainStage, so I’m accessing all the Guitar Rig plug-ins and Universal Audio plug-ins—which, by the way, are just awesome plug-ins.